Throughout the years of my studying Wing Chun Kuen, I’ve come across many people with different views of, and what practicing this system actually entails. So many have only watched a few video, so really do not have a clear view of Wing Chun from which they base their opinion, others may have made met up with a practitioner whom wasn’t very talented or was taught very poorly and could not articulate the basis of the System or its many facets properly. As mentioned in the previous post: ” https://pacificwingchun.com/2013/12/29/wing-chun-and-structured-mass/ ‎” many just do not understand all the aspects of, and what is entailed in the training involved and applications of technique possible within the system. There are to many video available, and article published to date that either give situational views or “what if” scenarios and specific answers for a certain staged or scripted attack verses Wing Chun Technique, then showing someone whom has no in depth study of the Wing Chun system under their “belt” deflecting and overtaking a supposed Wing Chun exponent. This is neither the way to learn Wing Chun Kuen if you are truly serious about understanding the System, nor is it a way to master any other martial art. Those ideas are opinions based upon staged scenarios. This to me equates to a situation twice removed from reality. I was told early in my martial arts training there are no “What If’s”. There are aspects within the Wing Chun System, that many overlook the practice of, as an integral part of their training. Stance, basic technique, form, weapons all have to be practiced with the principles of the system kept in mind, and the body mass as part of the structured attack must all be coordinated. But how are all these ideas or aspects of the system taught? These are not absolute concrete ideal you can personally hand to someone, it must manifest within the practitioner as they mature in their practice of the art. This takes time. I have come across many whom practice martial artists that wish to learn some Wing Chun technique only to find the training boring and then just look for the tricks or advanced techniques so they can become Wing Chun Masters, or so they may use this information to try and become the best fighter out there. In doing so they become neither. What will happen is exactly what has been happening for decades in the martial arts world. Some uninformed people spout their low opinion of Wing Chun Kuen, or like many so called new age advanced martial technique “specialists” they even propound that no martial arts work in a real combat situation. Well its a great angle to make a buck so I wish them many dollars and a happy life. I do feel that many whom train Wing Chun Kuen miss one aspect in particular within the system which connects the actual application of Wing Chun technique with the power of the practitioners body mass, it is the tool which actually applies this power or force. The development and use of Chi, or Qi. This cultivation and development of Chi is embedded within the system in several area, including San Sik and all three hand forms. If study of the basic concept of Chi Breathing and the Development of Vital Energies within the body are introduced as an important portion throughout the practitioners training regiment, Chi force will come in a natural progression as the practitioner evolves in his or her training. The understanding of Chi Development and its cultivation within the Wing Chun System will enhance a practitioners Kung Fu and Health immensely throughout his lifetime. Breathing, Chi Development, Structured Mass Movement, and Crisp Technique “With Meeeannning..” are all aspects within the Wing Chun Kuen System, when practiced, and executed properly make a practitioner a daunting opponent for any martial arts enthusiast. The father burst into tears and falls to his knees. A father returns home to find his estranged wife very high and irritable, while two children ages 10 months and 3 years are alone in their dark musty room in a small apartment in the middle of the Elsinore desert. As the father realizes exactly what is and has happening, the wife hastily threatens to call the police hoping to detour any reaction from the now very concerned father of the two innocent victims. The father agrees that calling the police is a very good idea, and proceeds to pick up a the phone hanging on the kitchen wall. As he does, the woman runs into the childrens room and picks up the 10 month old baby and rushes toward the door trying to make an escape with the child before the police arrive. The husband drops the phone and blocks the escape and takes the baby from the high woman. As the father comforts the child in his arms, the woman rips the phone from the wall in hopes that help will not arrive, and grabs the 3 year old by the hand and runs out the door before the father can act. The fathers heart drops as he sees that door slam and he has to decide how to best protect the infant in his arms and find his other child now outside with a very high irrational woman. Within seconds, baby in arms he rushes out the door to an empty corridor. Tears, Fear and Panic fill his mind and heart as he runs out to the street to see if there is any sign of them. Nothing. He pounds on the first apartment closest to them, no answer but he hears hushed noise from inside. He pleads with the tenant to open the door, no response. He then knows his Daughter is in there and demands the door be opened or he will break down the door. With no hope of police help and no good neighbors in the drug ridden desert community wanting to help, the father knew that if that door didn’t open in the next second he would break the door and face anybody or anything inside to get his child back. The door squeaked open and the father rushed inside and confronted the lady tenant whom insists to know nothing. the high mother and child nowhere to be seen. The father pleads with the woman for help, and then begins to realize this woman is hiding his child, he checks the rooms and then finds his 3 year old daughter in a closet with a sweet smile on her face playing hide and seek. The father burst into tears and falls to his knees as he hugs his two girls. This happened, around 1994 and happens to children every day. If your sick get help. If your not happy with your spouse get help. Only Children suffer, if you have children your life is for Them! Give them what they deserve or get your Dingus or Ovaries ripped out! Pacific Wing Chun Association has a new location. Be Well and Keep the Traditions! Throughout the years since the Bodhidharma traveled to China and Shaolin Temple at the foot of Shaoshi mountain in the Song mountain range in the Henan province, where Gung Fu began, there have been those whom study martial arts, but were never worthy of receiving such training in the first place. “Hell–a condition of despair in which one is completely overwhelmed by suffering; Hunger–a state dominated by deluded desire that can never be satisfied; Animality–an instinctual state of fearing the strong and bullying the weak; Anger–a state characterized by an unrestrained competitive urge to surpass and dominate others and often under a pretence of being good and wise. These four states are referred to as the Four Evil Paths because of the destructive negativity that marks them. ” (SGI-USA, http://www.sgi.org/buddhism/buddhist-concepts/ten-worlds.html). Even Bodhidharma was plagued with this problem by one of his followers before he even arrived in China. Some cannot grasp idea that, dedication to study, knowledge, and even Happiness cannot be transmitted from human to human, it develops within each of us. Only the ideas are shared among us, it is ultimately up to the individual to either study and manifest these lofty ideals or remain in the lower worlds or states of life. Every martial arts style, system, or pugilistic form has this type of person among the ranks today and has had them throughout the years from the beginnings. I have many martial artist friends from across several style, systems and lineage, they have all had personal experience with these people. It is nothing new. Today in the ever growing world of martial artists there is another factor which rears its ugly head among those whom reside in and among the Low Worlds, those whom hold greed close under false pretense of false sage or wisdom, slandering others. All whom study Martial Arts know these Truths, and most of us Respect each other, we may not share the same Ideas on how to take care of an attacker and send him home via the hospital, but we do respect each other and our particular Tao , or path in Martial Art. I do not know anothers intent, but when I see it I act, if the intent is to harm someone, I protect them. I uphold the Traditions of Wing Chun Kung Fu. Be wary of whom you teach, there are only few worthy. The term “Structure” holds different meaning and several function in the Wing Chun Kung Fu system. Within the first form Sil Nim Tao and basic San Sik a beginning practitioner will be taught Yee Gee Kim Yeung Ma or the Catch Goat Stance. This focus on stance or structure early in training is paramount if the practitioner is to progress and have functional technique. As a student is able to grasp these ideals of stance, rooted structure and angular stepping technique they will have progressed to a point where their technique will be functional, but maybe not at optimal performance. Only when an understanding of movement in stance, along with the structured mass of the body can the practitioners technique become really powerful. With proper timing of technique and structured movement of the body as one unit or a mass, strikes and kicks become much more lethal. Now for someone whom does not study Wing Chun in depth, they will miss several key points where the concept of structure, is concerned. We use the term Structure, but we do not advocate rigidity. Rigidity is not the the goal of structure within the Wing Chun system. A practitioner should focus on maintaining these ideas of structure which encompasses, stance, proper angular movement, footwork, along with properly timed and applied technique when engaging an opponent. If applied as a coordinated unit or body mass, the practitioner will be very hard to attack from any angle and also extremely lethal with response to any attack when applying Wing Chun technique. Happiest Holiday Wishes too all our Friends and Wing Chun Brothers. I am Blessed to have some of the most dedicated Wing Chun, Sifu’s & Practitioner’s whom have helped to make Pacific Wing Chun Kung Fu Association what it is today. I would like to acknowledge the deepest gratitude to my Sifu Alan ‘Bak Fu” Vasquez for the gift of this art, and to Co-Sifu Eugene Tagawa for your Years of Dedication and always thoughtful generosity! Me Ke Aloha all! Pacific Wing Chun Association Awards Scott Cannam with Honorary Black Shirt/Sash. Scott Cannam receives Black Shirt/Sash in Kailua Kona, Hawaii. 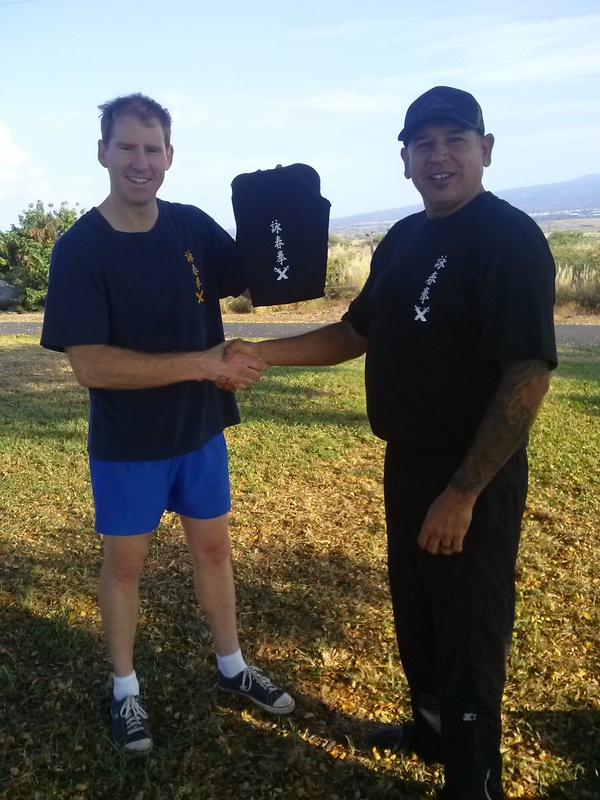 Scott Cannam receives Black Shirt/Sash from Pacific Wing Chun Association in Kailua Kona, Hawaii. As a sign of great respect to his Sifus and Wing Chun Family, Pacific Wing Chun Association Awards Scott Cannam with Honorary Black Shirt/Sash which represents his dedication in studying Wing Chun Kung Fu, and to the great skill of the Sifus whom trained him. 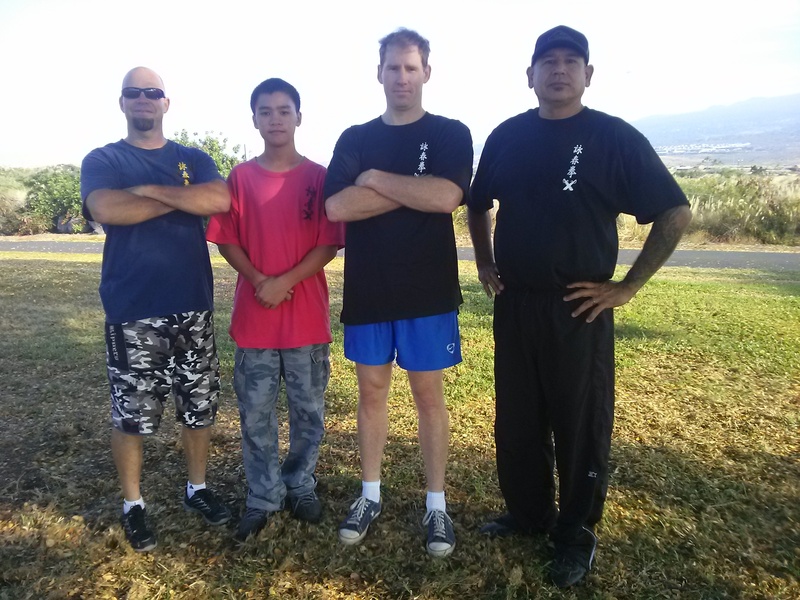 Scott Cannam founded the Red Deer Wing Chun group (Ving Tsun), in Alberta Canada. Scott Cannam is from the Greco Wong Kwoon in Alberta Canada. His Kwoons lineage is Yip Man / Moy Yat-Greco Wong / Kam Wong / Red Deer Wing Chun Calgary. Scott has great technique and very knowledgeable of the system and History of Wing Chun Kung Fu in general. Thank you for sharing your skill and knowledge with us Scott. You truly are a Black Sash Kung Fu Fighter! Whether attacking postures presented, redirecting incoming forces and attacking from outside angles, or defending a full frontal attack directly at your centerline from an opponent, there must be balance in your approach within each of these scenarios. Balance is said by many to be the most important factor to your defenses in a fight. It is also said to be the key to a successful attack. The fact is that Balance encompasses many ideas and has many applications within any fighting art. There are theory of balance within form training that apply to attacking stationary and mobile defense postures, defense of both soft angular attacking and attacks with solid forward momentum, and also to each of these ideas in combination. Within all the Wing Chun systems these ideas of balance are encompassed and addressed within the Hand Forms, San Sik, the Mook Yan Jong, and Weapons sets. Keep in mind that theory of actual application and training methods may differ due to lineage and family interpretation. Balance is important to every empty hand and leg technique applied within the Wing Chun system. We change angles of attack or defense when we feel pressures or changes in our opponent’s posture in order to gain advantage upon and absolute control of them. But if there is no balance in the application of our technique we may become victims to our own movement. For every strike thrown at us we have several options with which to change that strikes energy into one which we can use to our advantage. If we do not use a balanced response, we may overextend an arm or cross center just enough for a trained opponent to take advantage of it. Being over-committed is a common mistake that can have serious consequence if taken advantage of by an opponent trained to recognize this. “Strike when you should, do not strike when you should not”, or “Do not chase hands” apply in this scenario as forcing a strike can lead you into a bad situation if your opponent seizes the opportunity of a badly timed or an overzealous strike. Balance in application of technique and in structure and stance upon entry or upon reception of external forces no matter of angle or strength is paramount. “Accept what comes, follow what retreats” is a theory of balance and teaches us to use balance in our defense and attacking as well. Using a balanced pivot, or joon ma to redirect, or diffuse an oncoming force helps us to keep balanced structure in a clash, where energies would otherwise topple an unsuspecting fighter. This theory also enables us to take advantage of overzealous over-committed attackers whom have our destruction in mind and are using force and brute strength to try an overcome a trained rooted Wing Chun fighting structure. Balance in mind body and spirit is a popular way to describe the way a martial warrior should approach every aspect of life. Within the Wing Chun System this Ideal rings especially true.